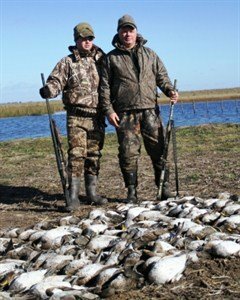 Argentina duck hunting at Las Flores is a real duck hunter’s duck hunt; a super combination of simple yet comfortable lodging, excellent service and fast-paced duck shooting. 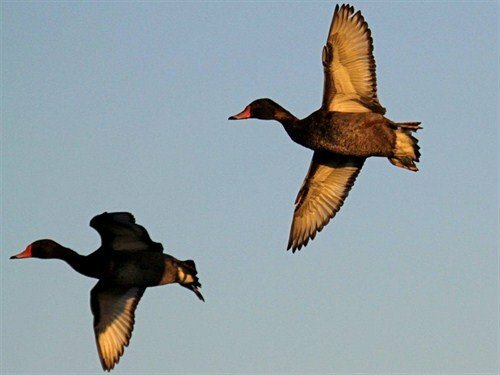 It offers some of one of the best values in volume Argentina duck hunting available. 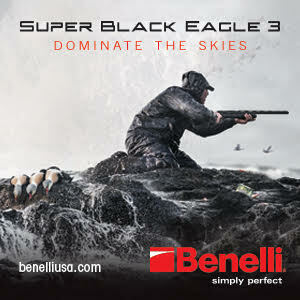 Look no further for an inclusive package to include superior duck hunting. The Las Flores Argentina duck hunt features comfortable, well-camouflaged dry and semi-dry blinds, and the quality equipment necessary to get ducks – lots of them – every single time. Easy, convenient walks to the blind are the norm. Absolutely no hunting detail is spared. There’s plenty of time for delicious chef prepared meals, enjoy the well-stocked bar, visit or doze by the fireplace, and get ready for the afternoon’s hunt. From Buenos Aires you’ll be driven straight to camp and will hunt ducks shortly after lunch. 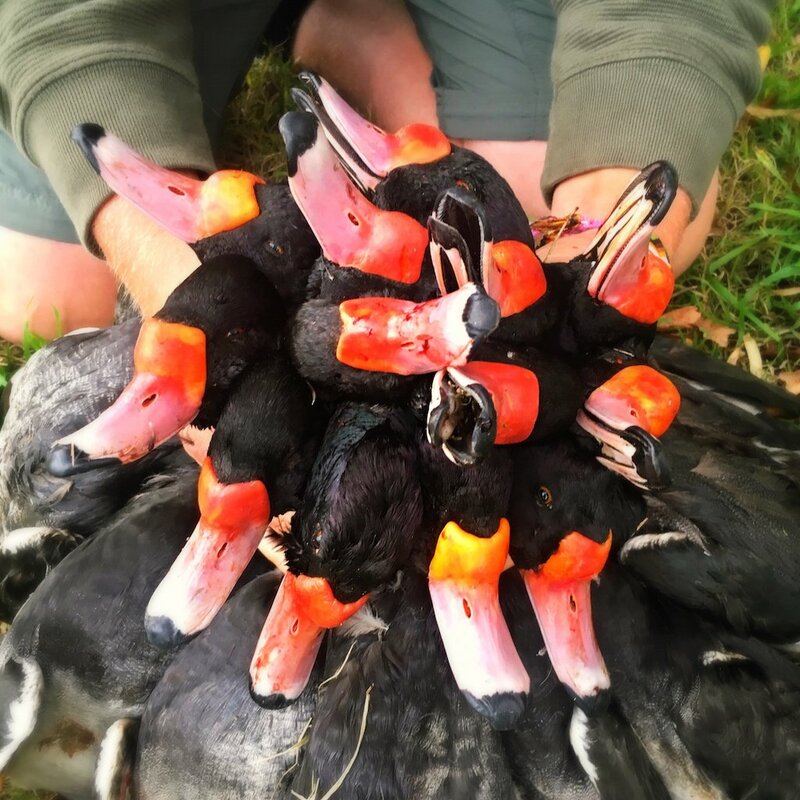 Mornings consist of fast-paced, Argentina duck hunting for a complete variety of species. No one in Argentina truly owns decoying rosy-billed pochards like this outfitter. Rosy-bills are the specialty here and abundant, but expect the full diversity of Argentina duck species. Shoot ducks twice daily, morning and evening, with plenty of relaxation and a mid-day siesta. Occasional afternoon shoots for doves and pigeons, as well as perdiz hunting over some of the very best Brittanies in Argentina are included at no extra cost – but most clients opt for more ducks! 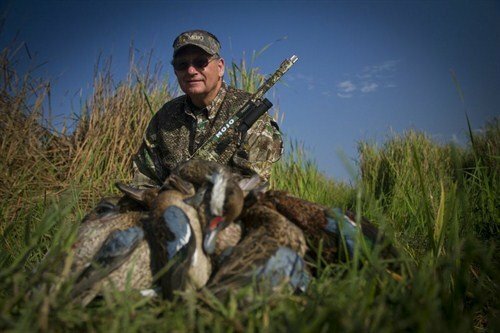 Duck hunting sites are intensively managed to ensure consistently high-quality shooting. Drives to the blind are usually within a half-hour. Expect very short walks over even terrain to the duck blind; guests with limited mobility are very easily accommodated here. Following the final morning duck hunt, you’ll be transferred for an overnight in Buenos Aires, to the airport for flight back to the U.S. that evening or on to another destination. NOTE: Exact drive times from EZE to camp vary among years depending on water conditions but are usually 2-3 hours. This outfitter makes superior duck hunting happen regardless of water conditions. There will be zero excuses. Ever. But there will be more decoying ducks than any other outfitter in Buenos Aires – and lots of them – every single time. 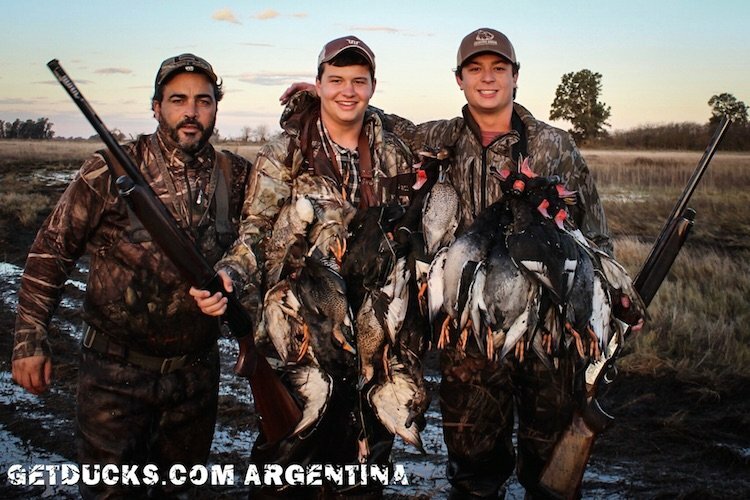 Argentina duck hunting at Las Flores is enjoyed late-April through August. Perdiz hunting is available only through July. 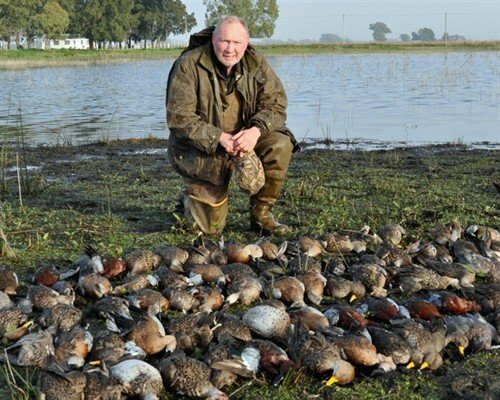 $3,500 Standard 4-day Argentina duck hunting package at Las Flores (4 morning duck hunts, 4 afternoon for perdiz, dove/pigeon, or big game). 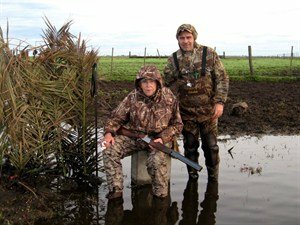 Special Note: Las Flores Argentina duck hunts are conducted 2-3 hunters per blind. 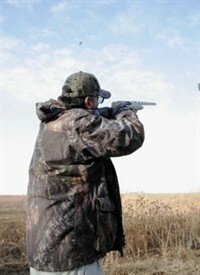 Hunting solo (only 1 guest per blind) requires a premium of $190 per day. Shotshells ($15 per box of 25) Prices subject to change. Day 2. Arrive Buenos Aires and transfer to Las Flores lodge. After lunch an afternoon hunt for perdiz will soon follow. Perfect way to stretch your legs after the long flight. Day 3-5. Full days of Argentina hunting. 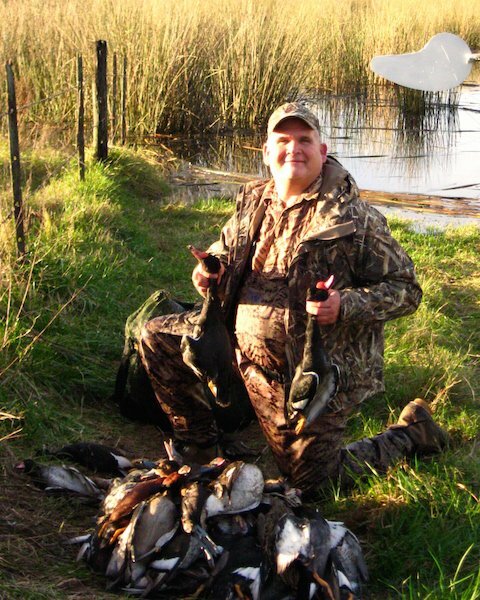 Both morning and afternoon Argentina duck hunts, or hunt perdiz, low-volume dove/pigeon or big game during the afternoon. All meals are enjoyed at the nearby lodge. Day 6. 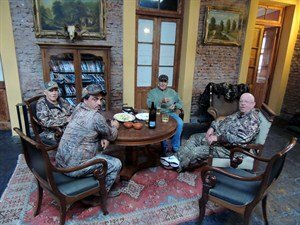 After final morning of Argentina duck hunting and lunch, transfer will be provided to Buenos Aires for your flight to US. Day 7. Arrive in the U.S. at your gateway airport and make connections home, usually arriving about mid-day. Your Argentina duck hunt itinerary may be fully customized to allow for touring Buenos Aires before or after your hunt. We will help make neccesary arrangements for tours, dining or shopping. Argentina dove hunting are also popular complements. 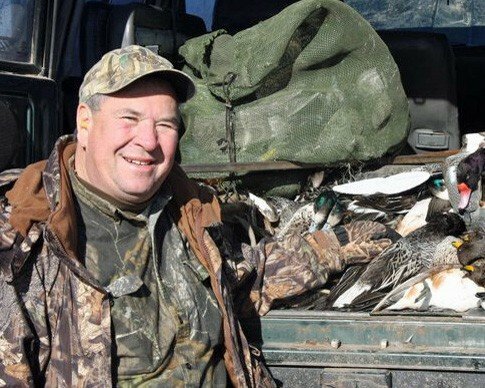 Packing for an Argentina duck hunt is not a complicated matter as the weather is comparably mild for waterfowling, and the walk or ride to the blind is relatively simple. You may choose to bring your own favorite firearm or rent from a selection of clean, reliable semi-automatic or over-under Reminton, Beretta and Browning shotguns. Lightweight, breathable waders are the perfect choice for the dry or semi-wet marsh blinds used while Argentina duck hunting at Las Flores. 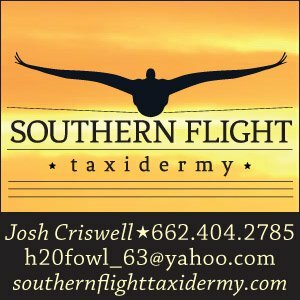 $50 to $100 for your shooting guide, per person for the total stay. 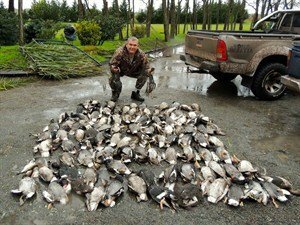 As an example, for a 3-day Argentina duck hunt at Las Flores hunt you will spend approximately $300 in tips, which is $100 per day. These are paid to outfitter when settling up at end of stay. Las Flores Argentina duck hunting included lots of ducks, friendly service and good accommodations. It was great shooting rosybills with my son every day. Las Flores Argentina duck hunting included lots of ducks, friendly service and good accommodations. It was great shooting rosybills with my son every day. 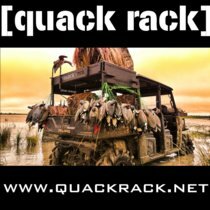 GetDucks.com was always friendly and prompt to questions. I rate their services as excellent and will refer anyone to them. We used another agency previously that was sloppy. 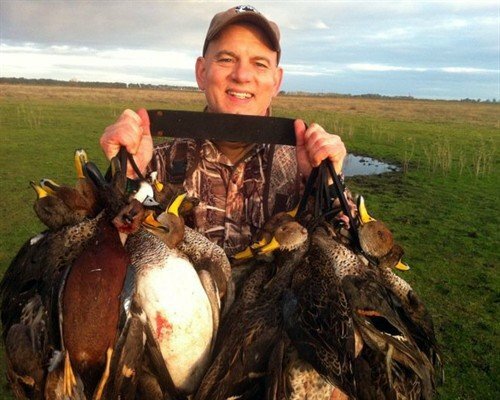 Our recent Argentina duck hunting trip was a five-star trip. The duck hunting was excellent. The food was outstanding…Please reserve me a spot next year. 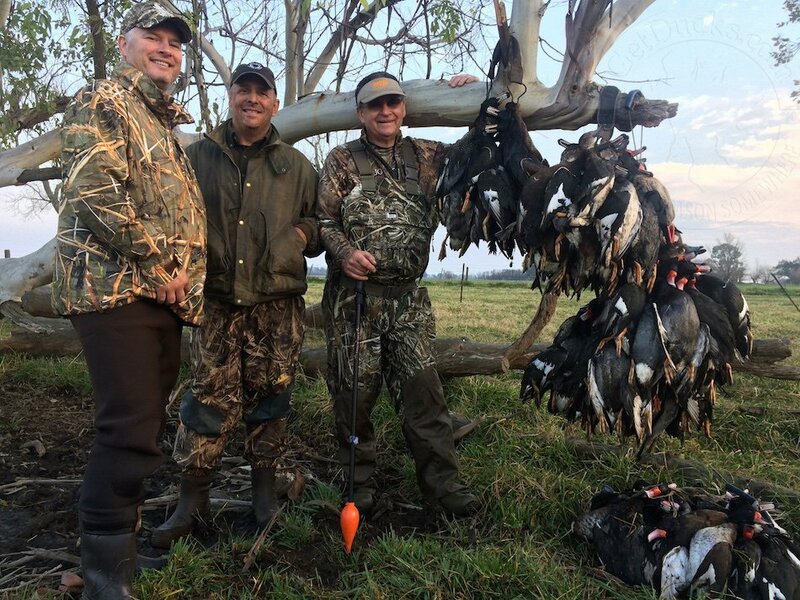 “Our recent Argentina duck hunting trip was a five-star trip. The duck hunting was excellent. The food was outstanding. I have never stayed at a lodge that has a top of the line chef and a pastry chef. Please reserve me a spot for next year. 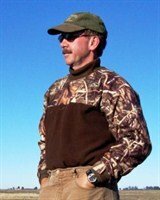 When I return to duck hunt in Argentina, there is no other outfitter I would like to hunt with. All we did were eat, sleep, and hunt. All three were great! 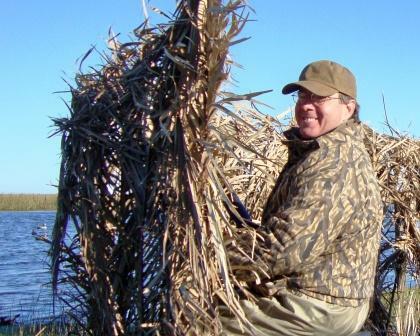 When I return to duck hunt in Argentina, there is no other outfitter I would like to hunt with. All we did for 5 days were eat, sleep, and hunt. All three were great! I do not enjoy traveling, but the hunting made it worthwhile. Best hunting trip I have ever been on. 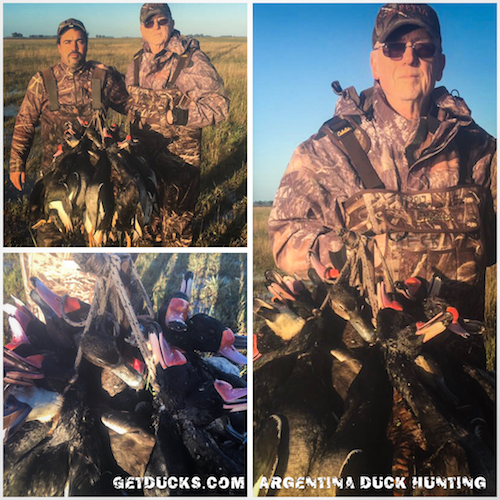 Las Flores Argentina duck hunting was a great father-son trip. Best hunting trip I have ever been on. 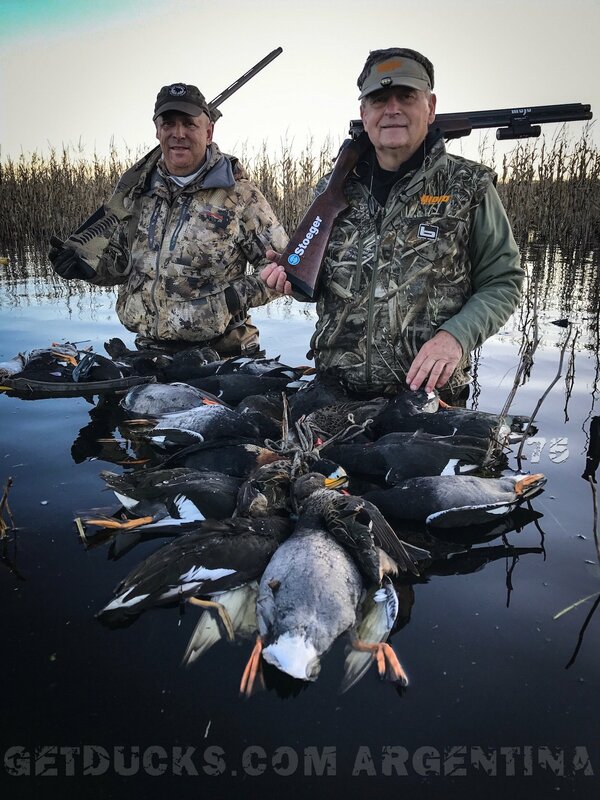 Las Flores Argentina duck hunting was a great father-son trip and we appreciated the abundance of birds killed, the at-camp comfort of lodging, and ease of the hunt. Me and Noah killing 110 ducks one morning will be a hard hunt to beat. Afternoon dove and pigeon hunting in great weather were the perfect follow up. Ramsey and Anita really know what they are doing and make travel easy. The GetDucks.com pre-trip information sheet was great. 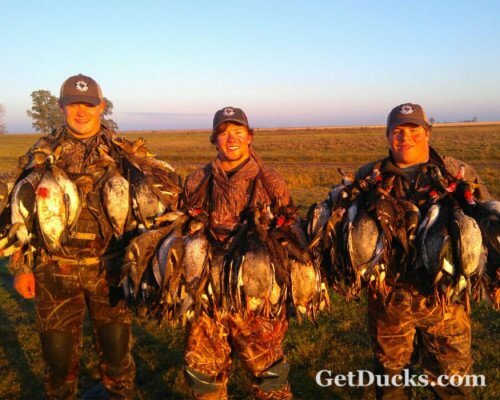 Great Argentina duck hunting! I will be back again this year. Great hunt! Going in on horseback to duck hunt La Paz marsh areas was a hoot. Martha, the full-trip hostess at La Paz, is the GREATEST!! One memorable duck hunt at Las Flores was over in 50 minutes – Pat and I killed 107!!!! I will be back again this year if schedule will allow. 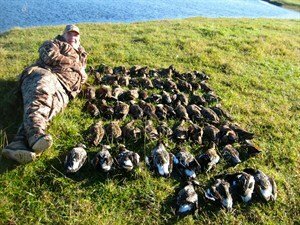 I will tell everyone about GetDucks.com and my great hunting. Anita went beyond the call of duty to get our flights fixed and hunt extended when we missed our connection in Atlanta, but I’ve come to expect nothing less from y’all. Two thumbs up. Thanks again GetDucks.com! 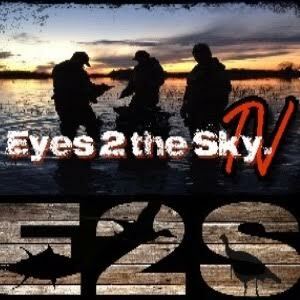 Epic Argentina duck hunting…ducks like the sky was falling. Yes got to do perdiz and pigeons and then hunted fox, killed 9 in 2-3 hours. The extra days with Diego were far and away the wildest shoots ever.